Kenny Harrison worked for thirty-two years as an award-winning artist for his local newspaper before pursuing his passion: writing and illustrating children’s books. He works using both traditional and digital techniques. Raised in New York City, he now lives in New Orleans with his wife, two children, and a menagerie of rescue pets. At the playground, Harry’s friends search high and low. 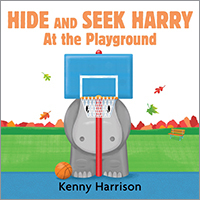 Whether he’s under the seesaw, behind the park bench, or hanging precariously from the swing set, it’s hard not to find Harry. But the fun is in the searching, and the friends are always up for another round!